The Gund Company understands the demanding operating environment of power turbogenerators as well as the scheduling challenges associated with generator re-wind projects. Our generator application and engineering teams have over 100 years of experience solving generator insulation and schedule challenges. Since 1951 we’ve listened to service providers and OEMs and understand the challenges you face each day. We’ve responded by developing quality products that meet your generator insulation protection needs. Our aerospace manufacturing process enables us to provide high-quality slot armor and turn insulation that meets or exceeds OEM specifications. The result is a series of high-quality generator insulation products that save installation and schedule time and help prevent premature failure. 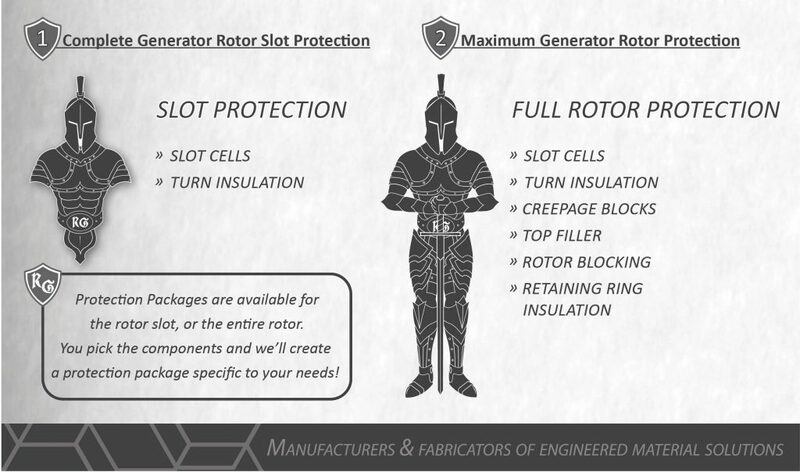 The rotor protection components are available in our RotoGuard Protection Packages. Slot Armor that contains voids and other defects can lead to premature failure, resulting in an emergency, unplanned outages or rework. The Gund Company’s aerospace manufacturing process results in the production of high-quality RotoGuard Slot Armor with uniform thickness and straightness in seamless lengths up to 30’ (9 m). RotoGuard Slot Armor is available in five standard configurations as well as a variety of custom configurations to meet customer specifications. Each part is 100% inspected for quality and continuity and can be hipot tested up to 20 kV. Common Shapes: L’s, U’s, Step, Club Foot, and specialty shapes available upon request. RotoGuard Epoxy Glass (EG) from The Gund Company serves as rotor turn insulation, sub-slot insulation, and filler. EG Turn Insulation is a fully cured, single layer of woven glass fabric that is impregnated with a premium epoxy resin. Our EG Turn Insulation offers exceptional chemical, oil, and moisture resistance, as well as dielectric strength. RotoGuard TIB is a pressure sensitive epoxy adhesive that can enhance the performance of RotoGuard EG, Nomex® 410, and other insulation materials. RotoGuard TIB bonds to copper with excellent shear strength at room temperatures, and up to 160 °C. This new turn insulation adhesive offers distinct advantages over traditional b-stage epoxy turn insulation. The superior tackiness of our TIB eliminates the time, labor, and material cost associated with using additional adhesives, such as double stick tape and messy resins. Its 4-hour, 95 °C epoxy adhesive cure time shortens outage and rewind project duration. Turn insulation coated with RotoGuard TIB has undergone tensile shear strength testing (cross-head speed 0.15 in/min.) and produced results exceeding 100 psi (0.69 MPA). RotoGuard TIB from The Gund Company is a Class F insulating material (meets 155 °C) when cured. The Gund Company custom fabricates corner strips, J-strips, and vented insulation for a complete Generator Rotor Protection Package. *RotoGuard Turn Insulation, equipped with RotoGuard TIB adhesive can be peeled up and re-applied to ensure proper seating and alignment with the copper.